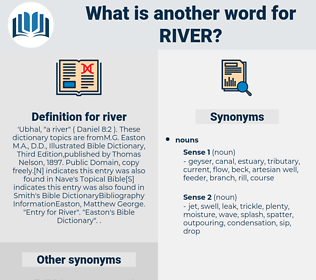 What is another word for river?
' Ubhal, " a river" ( Daniel 8:2 ). These dictionary topics are fromM.G. Easton M.A., D.D., Illustrated Bible Dictionary, Third Edition,published by Thomas Nelson, 1897. Public Domain, copy freely. [ N] indicates this entry was also found in Nave's Topical Bible[S] indicates this entry was also found in Smith's Bible DictionaryBibliography InformationEaston, Matthew George. " Entry for River". " 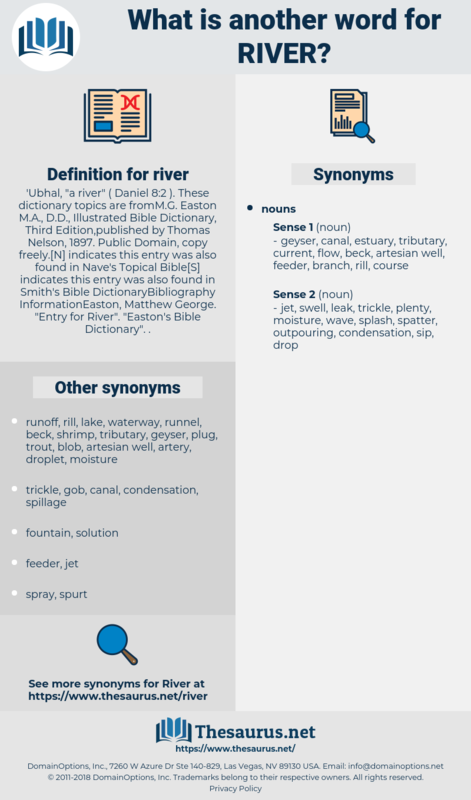 Easton's Bible Dictionary". . Populations, articles, structures, Guidelines, Publications, debits, ancestors, Greeks, titles, Les, Riviere, fluss, books, rio, RIOS. dive, screams, Cries, Les, catchment, rio. What is it you are doing at the river? Then the big red fish come up from the great water into the river. referee, revery, reefer, refer, robbery, repair, roper, rebury, rapier, ribier, raper, rivera, robber, Rob Roy, reappear, rubbery, rubor, Rapper, ripper, rubber, Ruhr River, reaper, riviera, rover, raver, riparia, reviewer, roofer, repairer, reverie, River Aire, revere.